Outside Learning-it is a two way process! Starting my recent workshops I was inundated with requests from the children ‘can we build dens?’ As an outdoor educator I have done a reasonable amount of outdoor activities, den building however I have to confess is not a speciality of mine! Not to disappoint however I said ‘absolutely’ and set about researching how and where to build a den so I could teach them how as I have since found out I was going about things the wrong way! Pondering this dilemma over the half term holidays I had a flash of inspiration! If I can’t build a den then why not find a man who can? I contacted a friend of mine and asked if her five-year old son would like to come and practice den building with me and ‘show me’ how it was done. Wow did I learn a lot! Let the children show you rather than you show them. 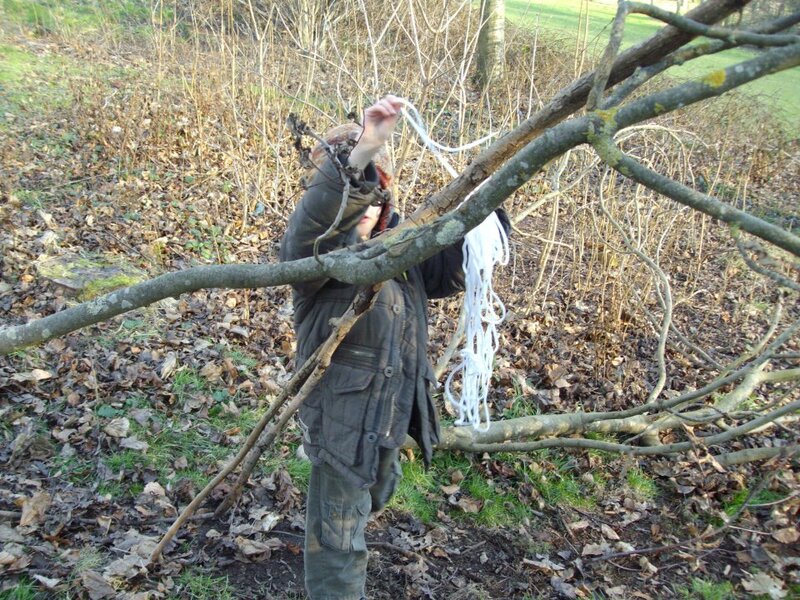 We ended up with a fantastic den made with branches pushed up against a tree, string added for decoration and to help make us ‘invisible’ to dog walkers. I could never have built a shelter anything close to the one we built that day. A week later, I tried the activity in one of my workshops with 10 children. I took them to an area of trees, presented them with string, and a tarpaulin and told them to build something. Using team work the older children delegated to the younger children and the younger children delegated to me and soon we had a waterproof shelter that we could all sit under and have a picnic. What did I learn: Children are the best teachers you could possibly have. You learn more by observing and standing back and letting the children come up with their own creations. The end result of this? Children having huge pride in their work and sense of group ownership of their own creation. Priceless! This is really good – a technique I use in music teaching as well (even when I actually can do it!) It really is a confidence booster and encourages the student to take responsibility for their own learning. Love this! I want to take some kids out and have them teach me how to make a den! In fact in my sculpture class that would be a grand project! Hi do you have any pictures of how your sculpture class went? I would love to see them!